I spotted many a grain elevator in my cross country travels, but this one in Lawndale Illinois caught my attention the most, for the faint “Faultless Feed” on the side of the grain elevator, plus as a bonus it was right on Old Route 66. While snapping my photos, I saw the lights down the track. I had to book it and run under the dropping barriers to get a series of photos of a passing Amtrak train. 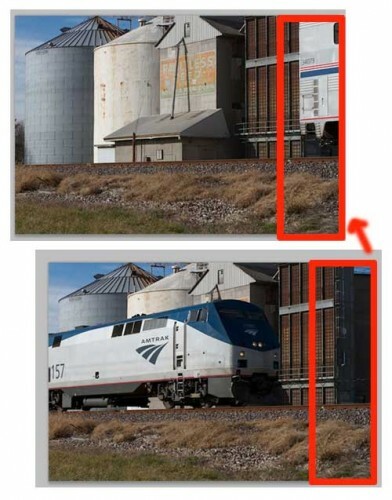 What could be more suited for doing animated GIFs than trains? “Train kept a rollin’ all night long…” “Down around the corner half a mile from here, see them long trains run and you watch them disappear…” Trains. They are in songs, movies, and a metaphor for steady movement. And they are ripe for GIFing- given their regular repeated motion. Capture the essence of train movement in a GIF, and do what you can to keep it under 1 Mb (much of the train passing is repeated and you can delete frames and not lose the motion). Step it up a notch and match your train gif to a song using http://gifsound.com. I had originally 20 photos of the train in motion, from it entering on the right, and passing out on the left in the last one. I would add as a continuity suggestion to get one more of the scene without the train. I imported these into PhotoShop like most of the other ones I have done – see the steps outlined for my GIFing the Streets of Liberal. After trimming/cropping, and resizing to 500px, it was still too fat, 3.5 Mb. I realized that most of the middle frames were repetitive, so I carefully examined and was able to delete 10 frames that were more or less the same motion. Without an empty frame, it seemed awkward on the loop, so I did a little Photoshop hijinks (quite easy). The first frame as the train just nosing in on the right, so I made a copy of that frame (using the little menu top right of Animation palette) and pasting it after the last frame. That has most of the “trainless” scene, I got the rest by copy pasting from the last frame, where the train is passing out of the left side of the scene. I set the frame rate of all the “train” frames to 0.1 second, but I made this last one 2 seconds so it lingers. The end effect is it looks like the train keeps going by on by. It’s a bit fast. Kind of a crazy train. And woah, completely by curious clicking, I got myself to ImgOps– a fantastic tool that lets you take an image bu URL and have at your hands a whole suite of tools you can use to edit, change, or do more with the image. This is amazing. Really. Can you see any use for THAT? Are you crazy?